Blueberry, pineapple, banana, blackberry: delicious whole fruits combine with a few other natural ingredients to make the sweet homemade jams we have known and loved for decades. From spreading it on your favorite breads to topping your pancakes, jams stand the test of time as a classic homemade staple. Jam has a history as rich as its taste, and an intricate creation process to match! Crafting excellent, flavorful jams is an artful process learned through many tests and trials. First comes selecting the finest of ripe, juicy fruits, where the possibilities and combinations are endless. Jams are a perfect food for discovering new flavors while sending your taste buds on a delectable adventure. Discerning the most accurate cooking time could be the difference between a wet sauce and the desired gel texture. Proper sterilization of tools and equipment ensures the jam stays fresh and lasts. The entire process of making jam requires patience, time, heart and extra care. Different forms of jam have been around for a while, so named in the early 1700s. Originally, only the richest classes could afford jam due to the high prices of sugar in Europe. When sugar prices fell in the 17th century, jams became more common. The jam we love today took shape in the 19th century when the working classes used the factory-produced sweet to enrich the foods they consumed. Fast forward to today and jams still prove wildly popular. However, nothing quite compares to the homemade taste of natural jams produced with zero additives or preservatives. At Vermont Harvest, we know the art of crafting gourmet jams. Using only the finest local and natural ingredients, we adhere to distinct, excellent recipes that make us experts in the realm of homemade jam. 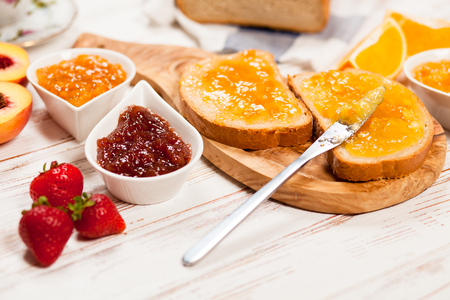 View our large selection of jams and jellies to discover your new favorite flavor!